2018, March 22 – Volunteering can be an incredibly rewarding and life changing experience, however it can also do more harm than good. Volunteering should mutually reward both the volunteer and the community in order to be considered valuable; all stakeholders should feel they benefit positively and equally from the experience (Child Safe Movement). 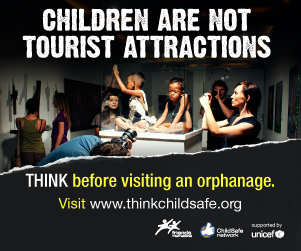 ‘Voluntourism’ refers to short term, unskilled volunteering (Rethink Orphanages). Specifically, orphanage tourism has experienced great growth in South East Asian countries in recent years (Rethink Orphanages). ‘Globally, up to 8 million children live in institutions, however over 80% of these children have living parents or family’ (The Conversation). Orphanages should be a last resort option, and efforts should be put into building families up to support them to care for their children. By investing in sustainable grassroots projects that support families and communities (instead of trying to meet the demands of foreigners for orphanages) we can encourage communities to stand on their own two feet. What are the main problems with voluntourism and orphanage tourism? It normalises access to vulnerable children – Strangers are allowed access to vulnerable children, thus exposing them to forms of physical and sexual abuse. Children experience a lack of privacy – All children have a right to privacy according to the United Nations Declaration on the Rights of the Child. It emphasises the ‘white saviour complex’ (AJ+ Video) – Whereby the traveller imagines a view of the ‘problem’ to which they are the ‘solution’. It creates attachment disorders – Children experience a constant rotation of visitors coming and leaving their lives. In worst case scenarios it exposes children to sexual exploitation, forced begging and human trafficking (Better Care Volunteering). Have all staff been informed on how to adhere to and implement the policy? Before beginning work, are volunteers background checked and asked to provide a Working with Children Check or similar? Is there a system in place for children to safely report their complaints and concerns? (Rethink Orphanages). 2. Do you have valuable skills to contribute? Are you trained and qualified in fields such as teaching, social work, film making, IT, nursing or international development and policy? If not, realistically consider what you are going to be able to contribute. If not, have you considered the effects your short term stay will have on the children you will be working with? You should always ask a child (and the organisation you are working with) prior to taking a photo with a child, as this protects their autonomy and dignity. You should never tag photos of children, or add children on social media (as this can expose them to forms of abuse). You should always seek permission from a child and your organisation prior to posting a photo of them. The strict Child Protection Policy at Center for Girls follows the United Nations Declaration on the Rights of the Child, to which Thailand is a signatory. The UN Convention on the Rights of the Child states that every child has the right to: Life, Development, Participation and Protection. CFG is committed to the safety and well being of all children. Our aim is to provide children with the safest possible environment at all times. When hiring, CFG will seek out staff and volunteers who demonstrate knowledge and understanding of ethical issues associated with research, monitoring, and evaluation and other participatory processes involving children and young people. Upon arrival, all staff and visitors must sign and adhere to our child protection policy, as well as view a powerpoint and take a quiz regarding the policy.